Rafael Solbes: Born 1940 in Valencia, Spain. Died 1981 in Valencia. Manuel Valdés: Born 1942 in Valencia. Lives and works between Madrid and New York City, United States of America. Juan Antonio Toledo: Born 1940 in Valencia. Died 1995 in Valencia. Equipo Crónica was founded in 1965 in Valencia by artists Rafael Solbes, Manuel Valdés and Juan Antonio Toledo. Toledo left the group shortly after their first exhibition. Emerging under the umbrella of estampa popular (popular print) and the influence of critics Vincente Aguilera Cerni and Tomàs Llorens, Equipo Crónica was in firm opposition to the abstract and informal tendencies championed by Francisco Franco’s administration. 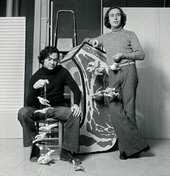 Solbes and Valdès signed a manifesto in 1965 establishing the group’s objectives to adopt a widely intelligible style that would reference everyday life. Among the most celebrated series that critiqued Spanish academicism are Guernica ’69 1969, in reference to Pablo Picasso’s iconic work, and Police and Culture 1971, reproducing contemporary art imagery combined with representation of the police, a symbol of oppression. Alongside other artists such as Eduardo Arroyo and Equipo Realidad, Equipo Crónica is associated with the artists who contested Franco’s regime, questioning its official culture as repressive. Concentration or Quantity becomes Quality 1966 belongs to an early series of works by Equipo Crónica, which manipulated photographs from the daily press. The black and white images of a developing crowd are presented on nine canvases in sequence in grey tones, denoting the threat posed by collective gatherings to Franco’s regime. Socialist Realism and Pop Art in the Battle Field 1969 reflects a further phase in Equipo Crónica’s oeuvre that questioned Spanish identity as the sterile product of a long gone ‘Golden Era’. The bright acrylic painting borrows the iconography of comics, showing the painter Velázquez with a speech bubble containing imagery as disparate as Andy Warhol’s Campbell’s soup cans and revolutionary workers in Maoist China. Oscillating between the iconography of socialist realism and North American pop art, the work encapsulates the global debate over figuration during the Cold War. Interview with the artist Manolo Valdés (Equipo Crónica), included in the World Goes Pop exhibition at Tate Modern.